For people practicing Chado, November is an important month. 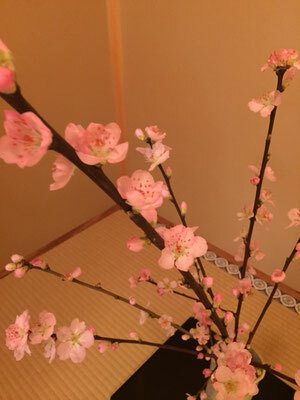 We do not have any holidays, though, we hold events to celebrate Robiraki (炉開き), Chado's New Year, which marks the beginning of Ro (炉) winter season of Chado. 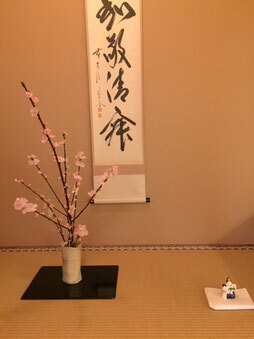 To decorate our Tearoom this year, we displayed a hanging roll of Sen Rikyu (千利休) at the Tokonoma (床の間), which reflected Rikyu's feeling after being ordered by Toyotomi Hideyoshi to commit suicide when he was 70. 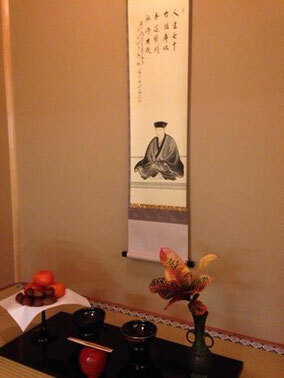 In front of the hanging roll, I remember that there was a long board with five items placed side by side: a plate of seasonal food, chestnuts and persimmons, a bowl of thin tea in a special chawan called Tenmoku Chawan (天目茶碗), thick tea and seasonal plant called Teriha (照葉). 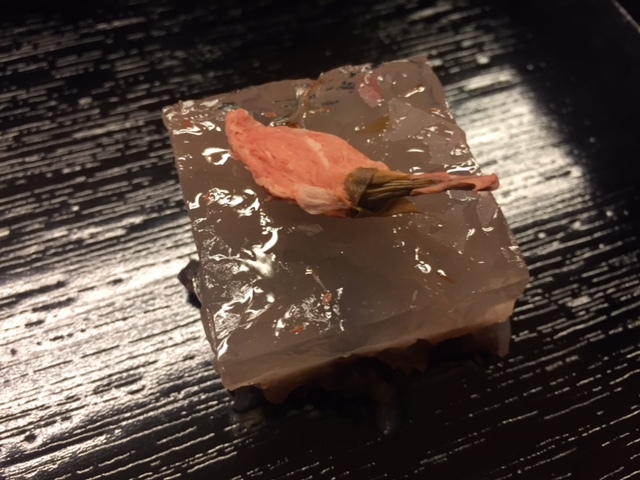 A red bowl of bean soup called Zenzai (善哉) was placed at the front. What impressed me most is the large leaf-tea jar Chatsubo (茶壷). New tea leaves had been collected in May and put inside it. In the old days, the seal of the tea jar would be opened and the tea leaves taken out for use in Robiraki. Our members gathered to enjoy the red bean soup and thick tea on that day, a simple but very meaningful experience. At the beginning of the Chado new year, what are your resolutions? "It was Nov 2013 when I first went to Saito sensei's place to have a Chado experience session. They were celebrating Chado new year, Robiraki. Not knowing what it was, I knelt down with others, enjoying a bowl of red bean soup and thick tea. It was great fun for a Chinese who knew little about Japanese culture. Times passes quickly. This is the eleventh years for me. What have I learnt? Not much as the Chado world is too broad. If possible I would like to learn more and more!